I’m a yogurt fan. Not the little yogurt cups that come in fun colors with cookie crumbs or sugar-sweetened fruit goo, though - I prefer the full-fat, plain variety. I’m lucky to live in Vermont, where I can get fabulous grass-fed yogurt. Unfortunately for some, yogurt has a fair amount of lactose, which can give a lot of folks unhappy tummies. 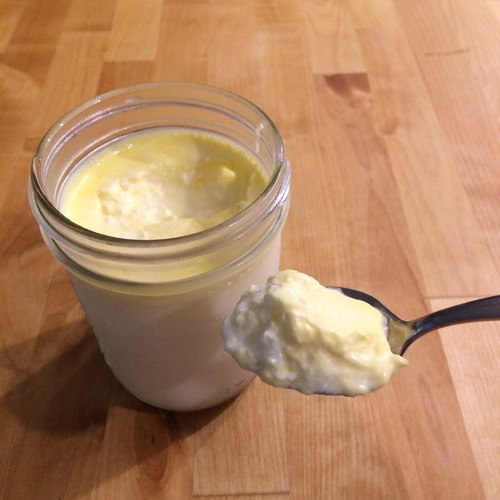 However, yogurt can be long-fermented for 24 hours (instead of the usual 4 or 6 hours), which enables the yogurt bacteria to eat up nearly all the lactose. 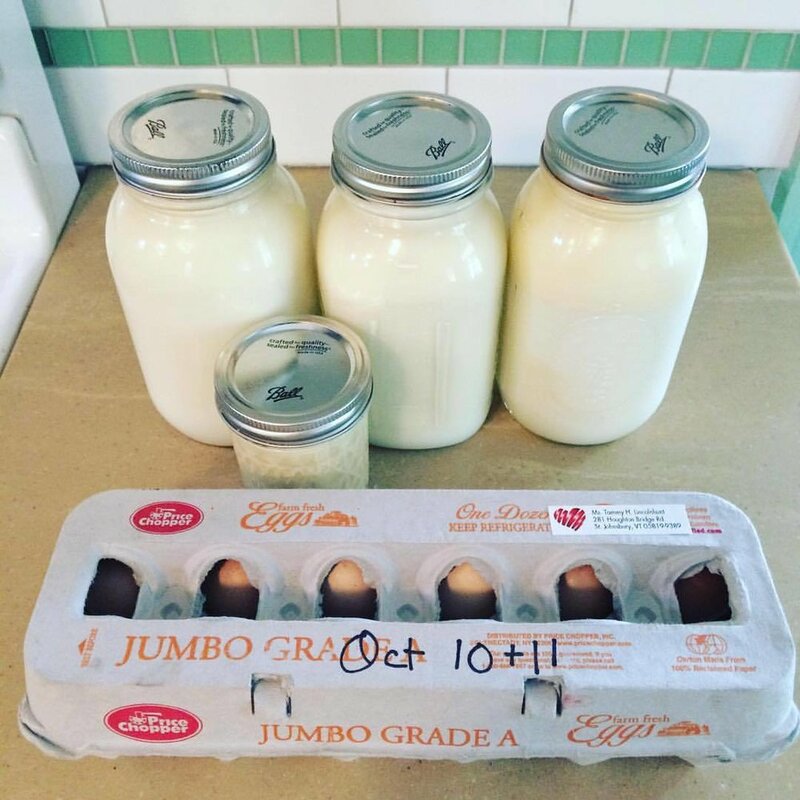 I got some fresh raw Jersey milk from a farm down the road from me. I heated 4 pints of milk in a pot of water until the milk reached 180°. I used a cheap kitchen thermometer to keep track of the temperature. I put a spoon in the water too, to sterilize it for mixing later on. 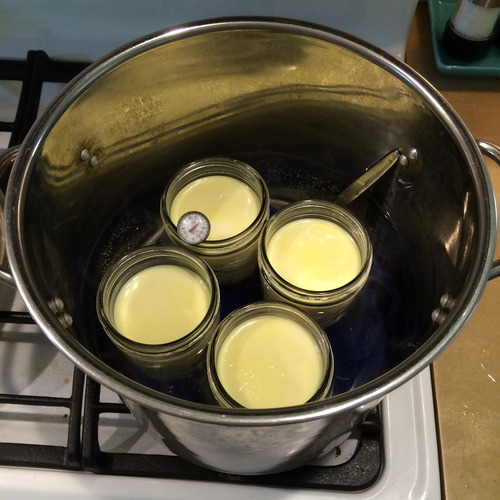 I took the jars out, taking care not to burn myself, and let them sit on the counter to cool. 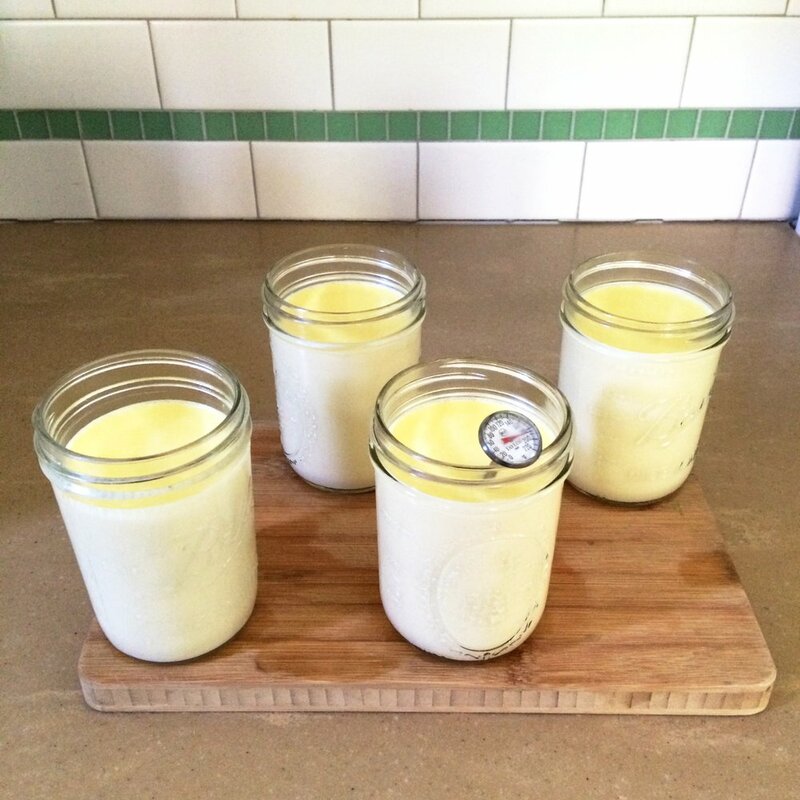 Once the milk had cooled to 110°-120°, I mixed a tablespoon of yogurt from my previous batch into each jar, and gently stirred it in, using my sterilized spoon. 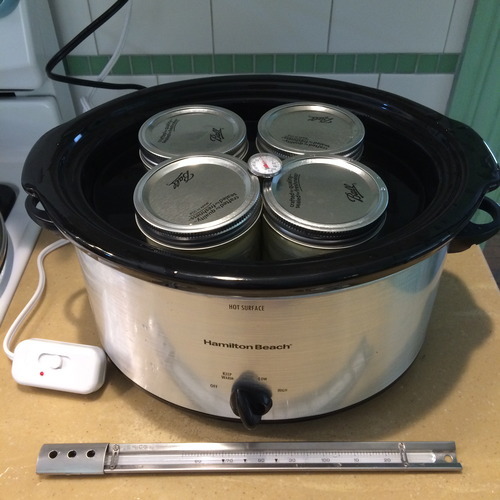 I warmed up my crock-pot insert, then filled it with 105° water and placed the jars in the water bath. I set the crock-pot to “keep warm”, and set the dimmer switch at about half-way. The dimmer switch (on the left) is pretty precise. 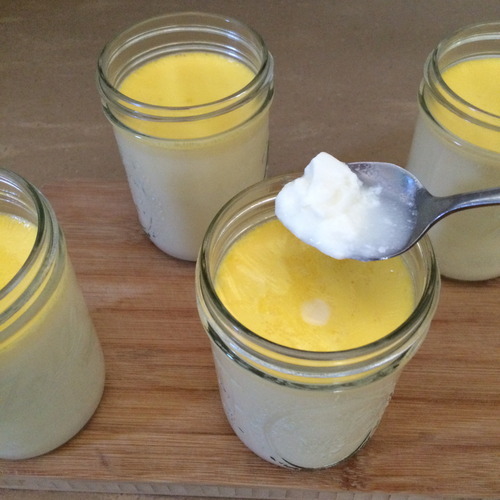 It took a bit of fiddling to keep the temperature steady, but the second time I made yogurt I already had it down pat. 24 hours later, I took the jars out, cooled them on the counter briefly, then put them in the fridge. IMPORTANT: do not get over-excited and mess with your yogurt at this stage! It needs time to sit undisturbed in the fridge to thicken properly. After a couple of hours I took the yogurt out. TA-DA! Nice and thick, and since the milk wasn’t homogenized, it had that awesome creamy top layer. So yummy! 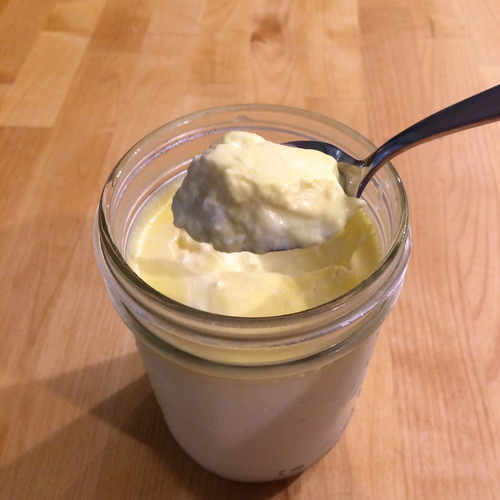 Since I wrote this original post, I have become the proud owner of an Instant Pot, which makes the process of yogurt-making SO much easier. In fact, the yogurt feature was the thing that tipped me over into buying an Instant Pot! Stay tuned for an Instant Pot yogurt tutorial in the near future!